Saturday, I applied a popular exercise mantra — “No pain, no gain” — to cooking. The gain — delicious Mini Pommes Anna — was totally worth the pain. I had purchased the entry-level OXO mandoline slicer several months ago, partly so I could make some version of pommes Anna, which is simply very thin slices of potato layered and baked with butter. (And if you’re one of those people who can make paper-thin slices of veggies with a knife, congratulations. You have mad knife skills. I do not.) I was in the middle of my final semester of grad school, however, so the mandoline has been resting in the gadget drawer. 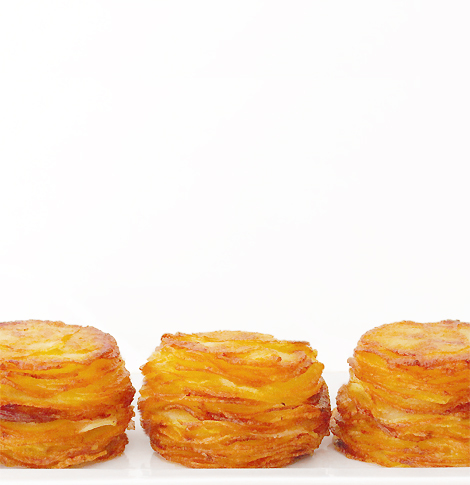 The semester eventually drew to a close, and Pinterest pointed me to this intriguing recipe for smaller, individually sized versions of Pommes Anna, courtesy of Naomi at Bakers Royale. The mandoline finally made its debut. And boy, was it angry. Seriously, I underestimated the danger of the mandoline (and found out that just about everybody has a story about somebody taking their fingertip off with one). Having failed to keep the potato attached to the finger-protecting holder mechanism, I ran it across the blade by hand, which worked great right up until the moment I cut my thumb. Don’t bleed in the food. Wrap the injury with paper towel to try to stop the bleeding, or at least keep the blood out of the food. Soldier on. You’re not going to make more blood by starving yourself. It was a minor cut, although it was a heck of a bleeder. The potatoes were simply divine. The mandoline had cut them into sheer little circles that, when tossed with butter and layered with kosher salt and pepper in a muffin pan, baked up into a luxurious side dish. The husband commented more than once on these buttery and creamy little stacks of goodness. And yes, there were only four ingredients: Yukon potatoes, butter, salt and pepper. I cut the recipe in half, so it made six. I figured two stacks per person was about right (they compress while baking, so each one ends up being about 1.5 inches high). We each ate a third stack, partly because they were so delectable and partly because they didn’t seem like the kind of food that reheats properly. And one of us was making replacement blood, after all. They were definitely a welcome change from mashed potatoes, which is what I usually serve with meat loaf (and more on that fabulous meat loaf later). Dude. I am drooling ALL OVER MY KEYBOARD. I can’t tell you how many times I have used a similar process in my kitchen when an injury has occurred. Reality is: I’M ALREADY HUNGRY. I can’t be cranky and light-headed when I go to the ER, so might as well finish the meal. I am just now getting a nail back from a Microplane incident of Christmas 2011. I bet you’ll make that sucker work next time, the handle thingy. Glad you didn’t cut your finger off! The recipe sounds great, sending it over to The Gent. If you find a brand of mandoline that you like, let me know. I’m thinking of investing in one, but I know I don’t want the OXO. When I want to slice currently, I use the slicer/shredder attachment for my KitchenAid mixer. I’ve got the big chef’s model, and it will drive all kinds of attachments, from meat grinders to pasta rollers.